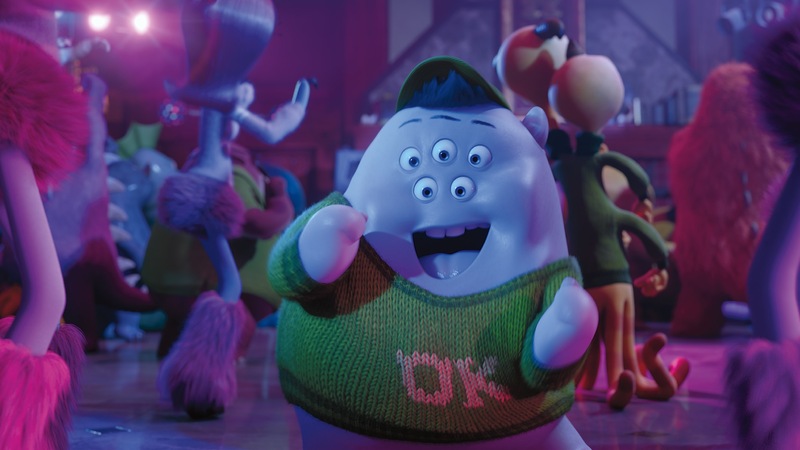 WARNING: This article will discuss, in at least moderate detail, the last act of Monsters University, so the spoiler-phobic should consider themselves…well, warned. Again, major spoilers ahead! Each of us reaches a point in our lives where we are forced to come to terms with the limitations of life. We all have dreams as children, of becoming astronauts, or movie stars, or athletes, in spite of the harsh reality that few of us—if any—will ever achieve those goals. If you grew up during the early 1990s, you might’ve thought, “Well, I’m going to be the next Michael Jordan. That’s just how it is,” while shooting a free throw or two into the basketball net in your backyard. Or maybe you thought you’d be the next Arnold Schwarzenegger while playing with a Terminator action figure. The odds, however, are stacked against the majority of us. The flashiest jobs are the ones we gravitate towards in our imaginations, but the humdrum avocations are the ones we’re likely to end up working in. This is not a particularly welcome or familiar notion in the world of family entertainment. Most movies aimed at families or, at least, children do not serve as a reminder that your pipe dreams will, more likely than not, remain just that: dreams. It’s possible to make a nuanced argument within that statement, of course, that there can be as much joy out of appreciating and loving your work even if it’s not what you spent your youth dreaming of. 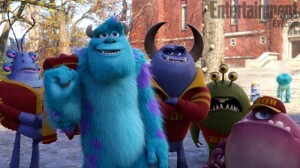 And so it is with Monsters University, Pixar’s newest film, and a very surprising one indeed. Some people (including the writer of this column) were not thrilled at the notion of a Pixar prequel, let alone one to the widely liked/beloved film Monsters, Inc. Most prequels, if not all of them, suffer creatively because they are inherently lacking in suspense. Hearing that one of the conflicts in Monsters University is that when best friends Mike Wazowski and James P. Sullivan, or Sulley, met each other in college they hated each other’s rotten guts may inspire a polite smile. But we all know that Mike and Sulley are best pals in Monsters, Inc., so presumably, in the prequel, we’re waiting for them to move past whatever foolish roadblocks there may be to their long and beautiful friendship. But that’s not the core of Monsters University, which is part of what makes this movie so good, even better than its predecessor. The core of the movie is not wondering how Mike and Sulley will become friends, it’s wondering what will happen when Mike realizes that his dream, such as it is, has to either die or be altered greatly. In essence, the arc of this movie is a character who dreams of being a hero but has to accept that he’s the sidekick. Mike is the scrawny kid who wanted to play on the Chicago Bulls, the asthmatic child who looked to the stars and imagined that he could walk on the Moon, the average-looking youngster who sat in awe of the movies and wanted to walk in front of the camera themselves. Mike wants to be the best scarer in the history of monsters; even though, as a walking eyeball, he’s kind of odd to look at, we know—and everyone else in this movie knows—that Mike will not hit that peak. This is his Mount Everest, and he will not climb it to the top. The real character arc in Monsters University is Mike’s, and whether he’ll ever accept his fate or deny it and turn into some bitter failure. We know he’ll do the former, but how he arrives there is quite compelling. One of the most striking elements of Monsters University is that Mike is told point-blank by a number of characters, including Sulley himself (both meanly and kindly), that he doesn’t have what it takes to be a scarer. To varying degrees, we may sympathize with Mike more than root him on to glory, because anyone who’s seen Monsters, Inc. knows that the mean kids in Mike’s grade-school class or Sulley or the imperious Dean Hardscrabble are all right. Mike isn’t built to be a scarer, as much as he may resent this truth or the characters telling it to him, specifically Sulley at the opening for not needing to work hard at his craft. The culmination of this arc, roughly the last 20 minutes of Monsters University, is one of the finest, most unpredictable sequences in Pixar’s canon. Mike and Sulley end up becoming friendly with each other while pledging as members of the same underdog fraternity taking part in the Scare Games, a competition among monsters to prove who’s the scariest of the scariest. As their frat—Oozma Kappa, or OK—traverses through each challenge, Mike and Sulley, as well as the rest of the OK crew, become more skilled and confident. The final challenge is a scaring simulation; each team’s combined score is added up, and whichever team is scariest wins everything. To everyone’s surprise, Mike—who goes last for OK—is so scary he gets a full canister of simulated screams. But not really. It turns out that Sulley tampered with the simulation so Mike would—even by snapping his fingers—win. When Mike discovers this betrayal, he decides, once and for all, to prove his worth as a scarer: he goes into the real world via a door being built in another Monsters University department. Once in our world, though, he realizes he’s not in the bedroom closet of some sleeping babe, but in the closet of a sleepaway summer camp’s cabin, filled with very awake, very curious, and very un-scared young girls. Left to his own devices, Mike is hit with a bucket of cold water in the form of inquisitive, bemused humanity. 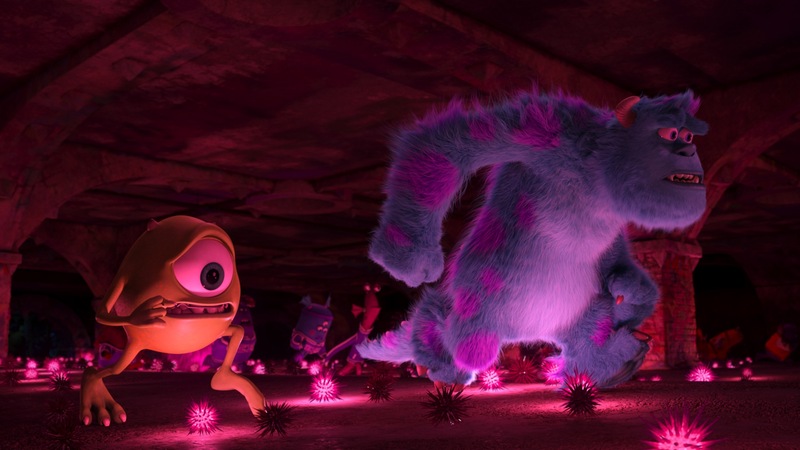 Eventually, Sulley comes to Mike’s aid, and together, they end up scaring a group of confused police officers by pulling out every trick in the monster/horror-movie book. But somewhere in the middle of the unexpected, exciting chaos, Mike and Sulley both admit that they are, even moderately, failures. Now, it’s a Pixar movie. So, if you haven’t seen Monsters University yet—and despite the spoiler warning at the top, at least one of you probably hasn’t and is reading this anyway—it will not come as a shock to you that Mike and Sulley get out of the human world and return to the comfort of Monsters University, before being subsequently expelled for their actions. And yes, Mike and Sulley do work at Monsters, Inc. by the film’s end, but not the way you might expect. For two characters who are such stars at their office by the time the 2001 film began, they started as lowly as possible: by working in the mailroom. Because they do have some kind of innate talent—Mike the book-smart one, Sulley the embodiment of raw fear when he needs to be—they’ll end up becoming popular, perhaps to the point where little monsters idolize them the way they idolized monsters in their youth, to the point of owning “scare cards.” But this dynamic duo starts at the bottom, working past their failings as monsters. Mike, especially, in the final moments, comes to grips that while he can be a great monster, and he can be great at his job, he can’t be a great scarer. The scene in which Mike and Sulley account for their flaws, sitting at the edge of a lake as the police approach their position, is one full of honesty that, frankly, Monsters, Inc. doesn’t match. (There’s emotion in that film, specific to Sulley’s relationship with Boo, but its manic pacing mutes the emotion until the last 30 minutes, whereas the emotional arc here is introduced in the first scene.) Sulley tries to level the playing field by admitting that his legacy status at Monsters University—such a clever choice on the writers’ part, by the way—means that he’s been given undue pressure to perform at his father’s mythic level. Mike, our lead, though, is the one who has just now accepted that he’s been pursuing the unattainable for his entire life. They do come together at the end, but this scene—today is not the day to dub it the film’s “Pixar moment,” but maybe another time—is powerful, swift, and true. Mike and Sulley hit a low point outside the cabin. Though it’s common to see our heroes face seemingly insurmountable obstacles, how often are those obstacles inward? How frequently, even, in Pixar movies do the characters have to acknowledge their imperfections in such a cutting, familiar way? Certainly, Sheriff Woody in the first Toy Story needed to realize that Andy could no longer have one truly favorite toy, but even this admission isn’t the same as a character accepting that a lifelong goal, one that hasn’t yet been reached, can never be fulfilled. Monsters University is, for the most part, a light, funny, and confidently entertaining film, a return to form for Pixar. It’s not just a return to the more consistently enjoyable films they made a few years ago—even Brave, a good film, had more story-related issues—but a way to get back to the basics of what made their earliest movies so beloved. Monsters, Inc. is a fast film, a funny one, and a farcical one, but by never slowing down to let the emotion of the moment and the bond Sulley made with his young charge flourish, it’s never been as profound or touching as intended. Monsters University, for its first two-thirds, isn’t bothered by emotion, letting it lurk and creep under the surface. In a way, Mike’s arc is a ticking time bomb, as we wonder how he’ll react, if he’ll lash out, how much he’ll deny the truth, and for how long. When he does come to terms with reality, nodding his head sadly and saying that the hopes and dreams that boosted his childhood have to be laid to rest, it’s quietly devastating. To move on from your dreams is something we all must do, but it’s never easy and it’s typically painful. Pixar, a studio built on the foundation of the impossible dream, allowing one of its heroes such a wrenching catharsis is impressive. And it’s surprising, in the right way. It feels like they’ve taken a long break from throwing audiences such entertaining curveballs, but it’s nice to know that Pixar can still throw us for a loop.